New York Comic Con is OVAH! It was a crazy busy and successful show this weekend. Boy howdy am I tired. Thanks so much to everyone who came by my table to say hello and/or purchase some of my wares. It was very much appreciated. Above is a look at my auction piece that I did for the show. A reaction to Ming Doyle's recent 'Flashbacca' drawing. I calls it 'Green Lando'. Maris' costume was loosely based on my recent Poison Ivy redesign which was neat. 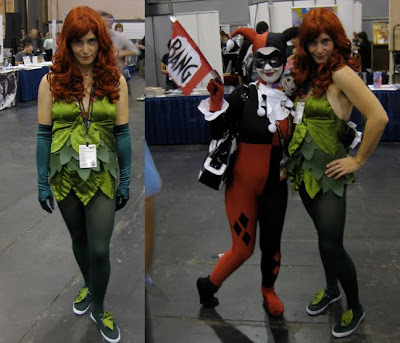 I think she made an absolutely stellar Ivy. There's lots more pictures, which I'll likely post in the near future. For now however, I'm goin' to bed. Green Lando - (in a singing voice) New Wallllpaper! Maris as Ivy - Jeepers! She looks lovely! 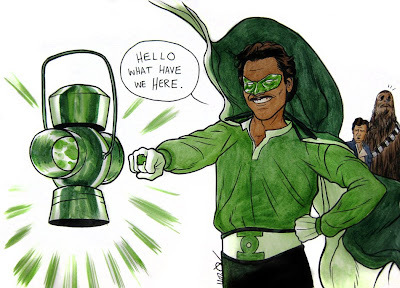 Joe, Green Lando is great. 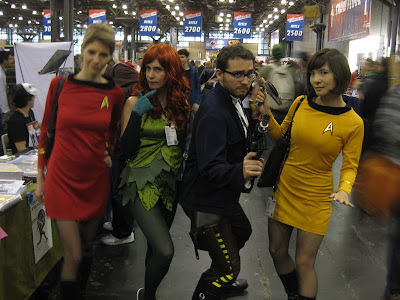 Chewie is Flash so who's Han gonna be? I see you like Harley Quinn. I just did a quick spotlight on Quinn at thebronzetiger.blogspot.com this is an invite man. It'd be cool to hear from you.